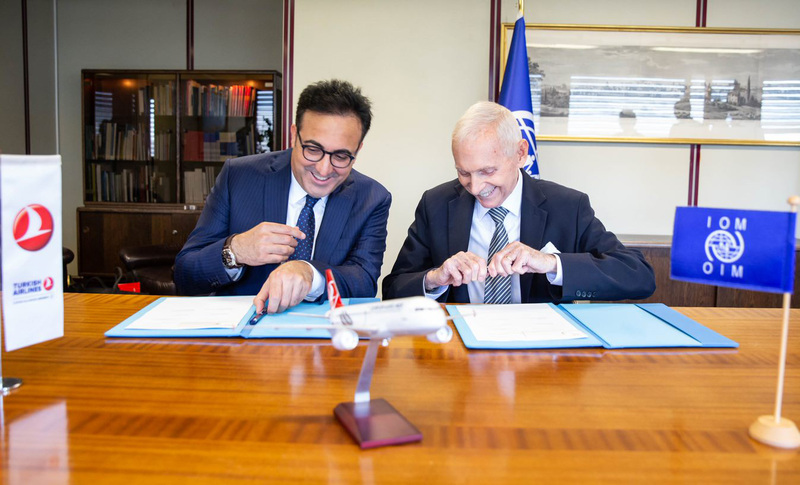 Geneva – The promotion of safe, orderly and regular migration is at the heart of the long-term partnership agreement signed yesterday (10/09) between the UN Migration Agency (IOM) and Turkish Airlines, one of the largest carriers in the world. 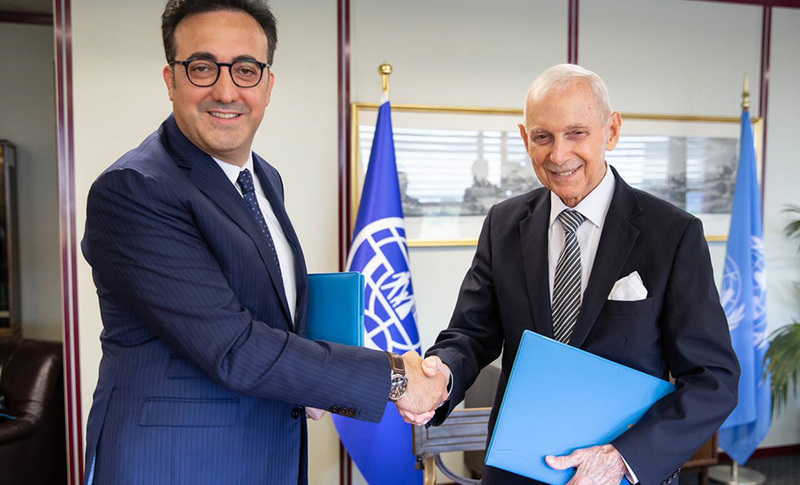 Signed by IOM Director General William Lacy Swing and Turkish Airlines Chairman of the Board and the Executive Committee, M. İlker Aycı, the cooperation will focus initially on the Organization’s Migration Application (MigApp), which leverages the widespread use of telecommunications technology to provide practical information about services available to migrants globally. “The agreement opens a whole range of possibilities for cooperation both in terms of Turkish Airlines’ commitment to social responsibility and our own commitments to migrants and refugees,” said DG Swing. “It is in many ways an ideal partnership as it will allow us to do a lot more in terms of informing migrants, in terms of promoting migrant rights, in terms of training to sensitize airline officials to smuggling and trafficking in persons which is one of the heinous crimes of our times,” he added. “As the national flag carrier of Turkey, a leading country today that tries to extend its hand to the vulnerable communities in the world, we are glad to strengthen our collaboration with IOM. Through this agreement we see a way to promote the idea of living together in peace and traveling freely and legally as envisioned under the Sustainable Development Goals of the United Nations.” Chairman Aycı said of the accord. IOM hopes that the agreement will lead to further collaborations on awareness raising campaigns on safe travel in countries of origin to help counter the trafficking of migrants as well as on cooperation on border support and documentation – including the possible training of Turkish Airlines employees and partners. In addition, IOM will share its work on migrant health, including travel health assistance/pre-departure health screening services with Turkish Airlines with a view to future cooperation. Finally, it is expected that Turkish Airlines will provide in kind support for IOM’s Global Film Festival on Migration which this year attracted 870 film submissions and will take place in over 100 countries in November-December 2018. The agreement with a major private sector company comes against the backdrop of the UN’s Sustainable Development Goal (SDGs) which recognizes the need for safer, orderly and regular migration (Goal 10.7), and as part of the forthcoming Global Compact on Migration, acknowledges that a cooperative approach is needed to optimize the overall benefits of migration, while addressing the risks and challenges facing individuals and communities in countries of origin, transit and destination. IOM’s MigApp, which was launched in December 2017 as part of IOM’s transition to digital mobility, seeks to offset the enormous volume of misinformation on migration circulating today by providing migrants with information in English about visas, health and travel regulations, alerts on global incidents arising from conflict or natural disasters, and the contact numbers of counter-trafficking hotlines around the world. A May 2018 update expanded coverage to French, Spanish and Arabic. MigApp was updated at that time with new migration-related information and services. For example, self-paying migrants travelling to the United Kingdom, Australia, Canada and United States from South Africa, Nepal, Pakistan and Egypt, can now book their medical appointments through MigApp. MigApp was developed thanks to financial support from the Swiss Agency for Development and Cooperation (SDC). Download MigApp for Android or iOS.